They say that curiosity killed the cat, but in this case, curiosity landed this puppy in a tight spot. 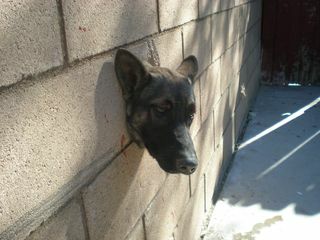 Rebel is a 8 month old German Shepherd puppy who just wanted to see what was on the onter side of the wall. He popped his head through the 18 inch cement wall, but getting out was not quite as easy. Once animal control arrived, they decided that if Rebel fit in the hole, they could get out without having to destroy the wall. They key: those big German Shepherd ears! With officers on either side of the wall, they tucked Rebel's ears back in and wiggled him back and forth for 30 minutes until he was free. They recommended that the owner keep the pup away from the hole until it was covered with chicken wire, but I bet Rebel won't be sticking his head back in that hole anytime soon. This is a good reason for supervising your dog, even in your own yard.